What is Technology Ache Syndrome? Technology Ache Syndrome or “Tech Ache” is a condition afflicting people round the world who spend long hours using technology. It consists of the nagging ongoing aches and pains that people suffer every day when using computers, laptops, iPads, Playstations, video games, Kindles, Blackberries and cel phones. Tech Ache shows up in different ways for different people. Some people have constant pain in one part of their body, such as their neck or their back or their wrist or their fingers. 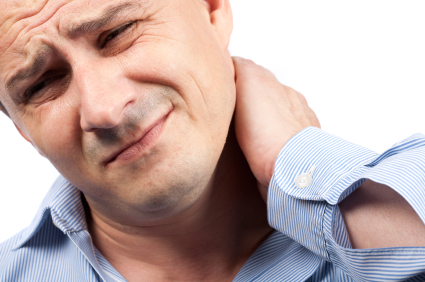 Others have widespread aches and pains ALL OVER their body. Some sufferers will experience stiffness and/or restricted mobility. Some sufferers will also experience stress and/or exhaustion as a result of the pain. Body Master Tahnee Woolf has identified Technology Ache Syndrome after first experiencing it herself, then studying this phenomenon for many years, as well as seeing its symptoms in hundreds of her own clients and speaking to many health practitioner colleagues who have seen these symptoms in hundreds of their clients. “Extensive research has revealed that many people around the world are sitting at their computers every day with aching backs, sore necks, tight shoulders, painful wrists, sore fingers, aching sit bones, tight hips, tired strained eyes and headaches,” says Woolf. “With no Remedy in sight” explains Woolf, “people believe that their only choice is either to suffer in silence or to quit their job. But of course in this economic downturn, no one can afford to quit their job! "So they continue to suffer in silence, taking toxic pain killers to get though the day, coming home from the office each night exhausted from the long day battling with pain and stiffnesss." "This is a pattern that has been going on for a long time in our society", says Woolf. "It is time that someone named it, so that we as a community can bring it into the open and start to deal with it." For too long, people around the world have been suffering from Technology Ache Syndrome in silence. 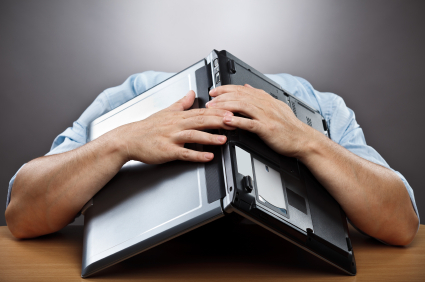 What Causes Technology Ache Syndrome? Tahnee Woolf explains how the human body was not designed to spend all day sitting in chairs, typing on keyboards, staring at computers, or flicking joysticks. "Our bodies go into contraction from the repetitive motions and rigid positions that are required of us when we use technology,” she says. In order for us to use technology as much as we need to, we are required to disconnect from our own body, to in effect turn off our own body's sensors. This is why the aches and pains can start to creep in when we're using computers, without us noticing them. Until eventually the aches and pains become chronic, at which point we can no longer ignore them. Woolf explains how in this current economic crisis, Technology Ache Syndrome has turned from a large problem into a sweeping epidemic, because the economic stress levels in peoples lives are adding to the problem. “When stress is added into the picture," she says, "People tend to spend even more hours at their computers, desperately trying to keep their job, look for jobs, or to distract themselves with online entertainment. Statistics confirm Woolf’s observations. Data from the American Productivity Audit in 2002 estimated that common pain conditions like headache, arthritis, back pain, and other musculoskeletal conditions cost $61.2 billion per year in lost productive time, and accounted for 76% of lost productive time. Over half (52.7%) of the workforce surveyed reported having headache, back pain, arthritis, or other musculoskeletal pain in the past two weeks, and 12.7% of all workforce lost productive time in a two-week period due to pain. Where Can Technology Ache Syndrome Lead? Tahnee Woolf warns people about where untreated Technology Ache Syndrome can lead. 'I can live with this'. They may think you can get by forever on painkillers and physical therapy sessions and massages." Woolf warns that Technology Ache Syndrome will only get worse over time, if left untreated. The aches and pains people have now are very likely to turn into debilitating chronic pain later if people don’t treat them now. Tahnee Woolf herself suffered from many years of worsening Technology Ache Syndrome, specifically back, neck and shoulder pain, as the result of her desk job as a lawyer. “At first I used to feel sore and stiff sitting at my desk working at my computer all day,” she says. At her worst, Woolf’s Technology Ache Syndrome became so bad that she was in constant chronic pain in the office and was unable to sit for even a few minutes. "The pain got so bad that I used to have to work lying on the floor!" says Woolf. She eventually had to give up her career as a lawyer as the pain had become too great. This led to a number of years of depression and anxiety as she tried therapy after therapy to get better, while her social life and career faded away. Woolf urges people to TAKE ACTION NOW to get rid of their Tech Ache! She says "Spend only 5 minutes doing therse Tech Ache Relief Remedy exercises now, instead of spending years doing rehab later. "Spend only $9.97 now on this Tech Ache Relief Remedy instead of spending thousands of dollars on doctors later. "Take action NOW to spare yourself years of pain later!" Tahnee Woolf reports that the traditional remedies for pain DO NOT HELP alleviate Technology Ache Syndrome. "Believe me, I tried everything!” She says. "I tried typing on fancy ergonomic keyboards, using complicated voice recognition software, buying expensive ergonomic chairs, working sitting on a fit ball, working standing up, working lying on the floor! “I tried pilates, yoga, myotherapy, massage, chiropractic, diet, nutrition, naturopathy, acupuncture, back pain exercises, stretches, strength training and lots of other things..." says Woolf. "I even spent six months sitting in a hyperbaric oxygen chamber for four hours a day! "But nothing helped relieve my Tech Ache." Eventually Tahnee Woolf decided to take things into her own hands. Woolf’s Tech Ache Relief Remedy consists of simple 5 minute exercises that you can do at your desk. The exercises consist of tiny sophisticated movements that reset your brain so that it lets go of all the muscle tension and contraction that is causing your Tech Ache. Woolf is launching her Tech Ache Remedy for a ridiculously low price - only $9.97! - because she is passionate about bringing her simple technique to as many people as possible. “This Tech Ache epidemic is costing our economy billions of dollars in lost productivity,” she says. “And it is causing millions of people pain and distress. And how is Tahnee Woolf’s life now that she has overcome her years of Tech Ache...? She can work at her computer happily for as many hours as she wants, she can play video games, sit in chairs, send endless text messages... and her body feels perfectly fine! Why Is The "Tech Ache Relief Remedy"
6 different audio sets on offer to soothe all kinds of aches and pains: back, neck, shoulder, hand, wrist, arm, hip, pelvic, ischial, sacrum, tailbone, eyes, headaches. Live life free from the stress of pain! Do it on any seat – in the office, in the car, on a train, anywhere! A powerful energy boost in only 5 minutes! Only $9.97 to completely change your life! It Gives You a Pain-Free Future! Earn as much money as you want, with your healthy pain-free body! **Find out more about the Tech Ache Relief Remedy HERE! Tahnee speaks passionately about this topic! People invite Tahnee onto their shows because she always brings the WOW factor. She's funny and inspiring in her sleep... but look out when she's speaking about a topic she's really passionate about! Tahnee would love to come on YOUR show and share her passion for Technology Ache Syndrome with your audience. She will bring this cutting-edge issue to light and inspire people to transform their lives! ** Read Tahnee's Bio here. ** See Tahnee's Appearances on Stage, Radio and Online.